One of the most popular alternative treatments for Autism, Down’s syndrome and A.D.D/A.D.H.D. is the gluten-free and casein-free lifestyle. It has not been proven to work, and many doctors are cautious about it, but if you’re wondering if it could help your child, read the facts below. It’s a strict elimination lifestyle (with no “cheat days”). This lifestyle removes two proteins: casein, which is found in all milk and dairy products, and gluten, which is contained in wheat, barley, rye, and some brands of oats [that may have been cross-contaminated with gluten]. The obvious culprits, like milk, cheese, yogurt, ice cream, most breads, cereals, and pasta, should be avoided. But thousands of processed foods contain ingredients made from gluten or casein, so staples such as hot dogs, lunch meat, bottled salad dressings, jarred sauces, and even some margarine may not be allowed. Examining labels and ingredients is a must, especially since some substitute-dairy products may actually contain casein. For the lifestyle to have a chance of working, the proteins need to be gone for good. In one study, kids who strayed from the diet just once every other month showed fewer improvements than those who broke the diet two times or less during a year. Research is mixed — but promising. A 2009 research review concluded that there wasn’t enough evidence to support a gluten-free lifestyle for autism, but some hopeful findings have emerged since then. In a small Danish study in 2010 of children ages 4 to 11, some kids showed significant improvements after 8, 12, and 24 months on this lifestyle. Researchers at Penn State surveyed the parents of nearly 400 kids with autism and found evidence that gluten-free improved symptoms such as hyperactivity, temper tantrums, problems with eye contact and speech skills, and physical ailments such as skin rashes and seizures for certain groups of children. Those who showed the most improvement either followed the diet closely, stayed on it for at least six months, or had a history of food allergies or digestive issues, like chronic constipation and diarrhea. No one knows for sure how it helps. One theory is that children with autism and Downs’ Syndrome are unable to fully break down casein and gluten and have increased intestinal permeability, or “leaky guts,” so the undigested or partially digested proteins leak through the intestinal walls and into the bloodstream. When they do, the proteins may reach the brain and can lead to problems with behavior, speech, and social skills. Many doctors don’t believe that “leaky gut” syndrome exists. Another theory is that children with autism may simply be in pain and discomfort because of an unknown intolerance to gluten and casein. And yet another is that when those proteins are gone from the diet, kids tend to feel better (and even sleep better), so they’re more alert, get more out of therapies, and make greater progress. According to a recent study, nearly half of all kids with autism spectrum disorders and Downs’ Syndrome, suffer some kind of gastrointestinal symptoms. While it’s possible that gluten and casein proteins trigger a body’s immune response, causing inflammation of the GI tract, it’s also possible that food allergies and intolerances aggravate autism symptoms. Experts do not understand why, but being gluten-free doesn’t help all children with autism. Those who have food allergies or chronic digestive problems seem to get the biggest benefit from being gluten-free. Getting expert help is key. Work closely with a health practitioner, such as a registered dietitian, along with a physician who is well versed with this lifestyle. The doctor can assess your child’s current diet, confirm if he needs other nutritional supplements, and help you plan meals and snacks. Gluten and casein are found in many foods that kids eat, so removing these foods can compromise health, nutrition, and growth if the new lifestyle isn’t well planned (especially if your child isn’t receptive to trying new foods). For example, gluten-free breads and cereals aren’t usually fortified with B vitamins, as standard grains are — and eliminating all dairy products means losing important sources of calcium and vitamin D.
It can be difficult at first. Eliminating gluten and casein means forgoing most processed and restaurant food. Many children with autism are very selective (“picky”) eaters, in part because of sensitivities to certain flavors, smells, and textures of foods. The foods many kids rely on — such as regular crackers, cheese, and yogurt — aren’t allowed on this lifestyle plan. Because gluten and casein proteins are thought to have an impact on the brain, children may go through a type of withdrawal when they’re removed. Some parents who have had success with this lifestyle suggest removing casein first and then gluten a week or two later. Gradually introducing substitute foods (like non-dairy milks that don’t contain casein, or gluten-free pasta) can help too. You can expect to spend more time planning and preparing food, especially when you first begin the diet. You’ll also need to be mindful of cross-contamination with gluten: Avoid sharing serving spoons or using the same cutting boards or toasters. But if your child experiences improvements on this lifestyle, these extra measures won’t seem like a big deal. Some parents notice improvements quickly, within a matter of days or weeks. But for others, improvements can take months, and some parents may not see any change at all. Although casein clears from the body in just two to three days, it can take four to six months for all traces of gluten to be gone from your child’s system. Plus, if your child has been diagnosed with celiac disease (an inability to digest gluten), it can take months for damaged intestines to heal. So give the diet at least six months before passing judgment. Before starting the diet, figure out what improvements you’re hoping to see. Take a day or two to establish a “baseline” by asking yourself these questions: How many words is your child saying? How frequently does she make eye contact? How many tantrums does she have in a week? Then, over the course of weeks and months on the diet, reassess your child’s development. If you’re not seeing any significant improvements, the diet may not be worth your while. Dr. Howard Peiper, who specializes in nutrition and is the author of “A Guide Through the Gluten-Free World,” describes gluten sensitivity as a chameleon-like condition which, depending on the individual, can cause skin problems, neurologic disorders, including severe headaches and impaired movement; autoimmune disease such as rheumatoid arthritis, lupus, diabetes as well as chronic fatigue syndrome, fibromyalgia, asthma and chronic infections. The good news about this condition is that awareness has steadily increased in the last 10 years and more gluten-free products are available now than ever before.Major supermarkets devote significant shelf space to these products, the FDA has established labeling guidelines for packaged gluten free food products, and the National Restaurant Association survey identified requests for gluten free food among the top 10 industry food trends. 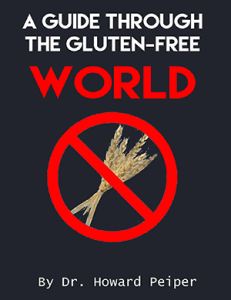 His book, A Guide through the Gluten-Free World, is now available through Amazon and CreateSpace. For a limited time, you can download the book FREE with a purchase on this website.